Treat yourself to a delightful stay in an authentic 18th-century Château. Come to the Lorraine, just outside Lunéville and discover this four-star hotel and its gourmet restaurant. 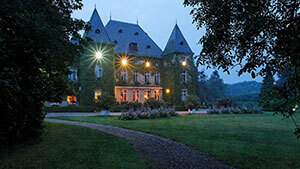 It is a member of the prestigious Relais & Châteaux Association. The Château d’Adoménil is located in the heart of the Lorraine, 3 km to the south of Lunéville and about 30 km from Nancy. Our four-star hotel is set in 20 acres of wooded parkland. We also offer a gourmet restaurant dedicated to the French art of living. Calm and serenity – these are the hallmarks of this haven of pastoral peace and of all the new sensations, discoveries and encounters that await you here. We are a Member of Relais & Châteaux, and boast 14 authentic, spacious guestrooms & apartments and duplex suites. They are appointed with a harmonious blend of tradition and modernity.